Ven. 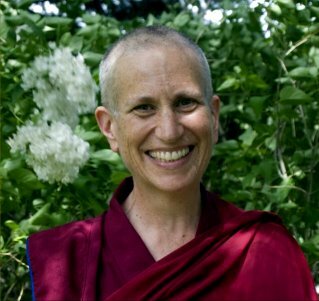 Chodron gave this talk on the opening session of His Holiness the Dalai Lama's five days of teachings on the Lamrim Chen mo. She leads the discussion on the layout of the stages of the Path and how they will relate to the meditation practice by giving suggestions on how to explore going beyond our present limitations and discovering our individual potential. She discusses the current worldview of an objective world and challenges the strong view of the "ME" which seems to be the centre of universe. She advises us: "Don't believe everything you think" and discusses the disadvantages of having the self-centered way of thinking. She then discusses Mind Transformation, lack of inherent existence and cultivates caring for others. She speaks briefly on Dharma practice – internalizing the Teachings and the creation of the causes of enlightenment, and she says that we are not alone on the path. Being one with itself, the Absolute has no way of experiencing itself in the way we usually associate with experience. Normally, when we think of experience, there is the sense of the experiencer, the thing experienced, and the experience itself. Now I say (and the masters also say) that this triad of experience, experiencer and thing experienced are all one play of the one consciousness. Yet once the consciousness or the beingness is operational in the body, that beingness - which is pure in essence - goes through a whole series of experiences. So for a while the beingness itself is expressing and experiencing all these diverse and changeful states: growing up, childhood states, youthful states… It has to go through it. All the rebelliousness, all the frustrations, every emotional expression will pass through. It's still only the beingness experiencing it, but it experiences more intensely when it is clothed in the identification 'I am the body, I am the person' and this body mind identification that has been taken up by the beingness imprisons the beingness in this mode, 'I am this person'. Yet whatever you are going through, the flow of thoughts and emotions, all the pleasures and predicaments of human life, are only sensations occurring in the beingness. Now the invitation of satsang, is always pointing the attention back, reminding: 'You are only consciousness. The individuality is not true for you, it's not stable, and it's not your original state. It's not constant, it's the variable'. Anything you can say about yourself it's not true.' You will feel very strongly about some idea, emotional thing or judgment, but you are unable to stay put in that state because any state is changeful. You Remain as the Pure Consciousness. When the identification that the consciousness has formed with the body, and the belief 'I am the body' is present, consciousness doesn't know itself as consciousness. It only becomes aware of itself at the body-mind level and so falls into confusion. The consciousness that is identified becomes the culprit in life. It's only on the basis of the identification that we seem to pass through so many struggles, to feel separate, fearful, to fight and be in conflict with other people or, I would say, other 'points of consciousness'. As you can see, this world has somehow come into a very troubled state; this is nothing more than various identifications consciousness has formed with the sense of an independent and separate 'me' as different from 'other'. You are fully this human being, you may say that. What can it mean? It means that the consciousness operating within the framework of the qualities of the human form will have a certain field of identification and expression that is unique to the species human being. That's fine. But also, as that consciousness, you are able to dive deep. Dive deep means to question yourself. Question not only what you are perceiving (which tends to take your attention outward), but question the perceiver, which is to take your question heart-ward. 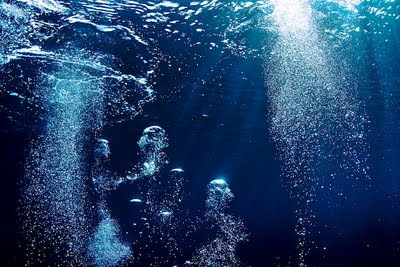 Dive deep and don't give up deep diving until you have touched the base, the ocean-floor, the deepest place. When you touch this ocean floor, you will remain as ocean floor, as beingness. This beingness is nothing other than yourself. That yourself-ness is contained in this sensation, this natural, subjective, self-awareness, 'I am'. The 'I am-ness' is the Godly principle in this form. When it associates with body and forms a secondary identity, it falls, you may say, from the Godly state to the earthly state. It falls from the heart to the mind. Don't cling to these descriptions too tightly - they are only the fragrance. Catch hold of the scent. Let the scent lead you to the source from which it is coming. That source is only yourself. Normally, some urge arises in the body and is perceived based upon the idea we have of our self, our conditioning, our unique value system, our former judgments and what we have learnt. Whatever arises in us passes through this filter of judgment - 'that's good' or 'this is bad' - and we make much effort to control our conduct and behavior. Normally this is fine, because if identification is very strong for us then we must follow the moral codes, we must have a sense of what is right and wrong; to forsake what is wrong and to take up what is right. This is the best way once identification is there: Do good, shun evil, meditate, eat healthily, exercise. All these things; they are good. Whatever Arises Is Pure Sensation. But for the consciousness which has come home, returned to itself in purity, which has investigated the claims of separateness and personhood and through the living inquiry has seen with clarity that all these are thought formations, ideas and concepts, that have somehow been infused on the pure consciousness, it is recognized that consciousness by itself has no quality. These things aren't inherent in you really, but appear only through the identification, and it's upon the identification that these qualities impact. But who is the ultimate seer? Something witnesses all of this, watches the passing and the arising of all these thoughts that were formerly thought to be concrete and real, yet are now seen to be the play of mood. There is a stream of sensations arising in the consciousness, but it's now understood 'that is not me'. For that consciousness, it is very different: There is no need to suppress anything and no need to control. Because simply, one realizes it's all formations of identification. So now an urge arises to smoke, or go out or something, but if the identification is not there, no judgment is arising. It's understood simply as a movement in the beingness, as the desire of the beingness, whether the flavor is beautiful or not. And the one who will evaluate beauty or not beauty is not present. So whatever arises is pure sensation stripped of the meaning that would have been given to it by conditioning. It arises within beingness as pure sensation. There is nothing to resist or fight against, because there is no other for there even to be the sense against. All is sensations in consciousness. Who can describe the state of such a one? By what are you limited? The body is there; because the body is there, consciousness is there, life-force is there, thoughts, sensations are going to be present. The ocean contains everything: water, fish, bubbles, waves, shells - every kind of creature comprises ocean. Similarly, all sort of expressions, movements, qualities are inherent in the ocean of consciousness. The name of that ocean is 'I am’. I am. Yet you are beyond the words 'I am'. Because even to say I am, you are already there to hear I am. I am is only a label, a sign pointing to that which you are. What are you? Anything that you can say you are, you cannot be. Who is saying 'I am that' or 'I am not that'? Again, I don't expect an answer. In the question itself, the mind is pointed again to the source. Source is all there is. And all of this is only to bring the attention to the source. Source is the source of everything. You as this source, the original one, self-containing all peace, all joy, stillness, unshakeable, infinite, eternal. All these are, you may say, the nature of that which is. That which is cannot be pointed to or conveyed by any term, any word. It is alone by itself. I am that. I am the indescribable, untouchable, unknowable, beyond experiencing of the mind. Stripped of every definition, every title, every association, and all quality. Stripped of whatever is perceivable phenomenally, stripped of the five elements and their play. I am. Not 'I will be'. Because I cannot speak of myself as 'I was' or 'I shall be'. I am is the most truthful expression. It is the very vapor that arises out of this infinite beingness. Stay here. For those who have come here, whatever arises for you, the invitation is to touch base, dissolve, and be as base. Thereafter, do what you like. That's not my concern. Know Yourself As This Beingness. It's not my interest, because activities are not contrary to truth. But activities that are fashioned or claimed by the sense of separateness or identity are bound to cause trouble, because the idea that oneself is a specific so-and-so and the belief behind that conviction is total delusion, totally illusory, it's not true. First that identification must be baptized in this seeing - this seeing that is being. You must know yourself as this beingness. Not in an intellectual way, but by dissolving the identity. How is the identity to be dissolved? By recognizing that whatever notions I have about myself and truth are simply notional, they are not true. I discard, I reject them. Whatever thoughts arise, and the temptation to encapsulate a sense of myself in them. 'No, cannot be me'. How to find this? Don't touch any thought. Don't touch a single thought; as it arises, keep your mind in neutral. Stay as emptiness. That emptiness, anything can wash up in it. All these sensations are swimming up and through it, all these bubbles are flowing up to the surface in it, and they must be. Don't touch them. There was a time when you will not feel able to do this; and then you will see 'I am not able to do this' is also a thought. I do nothing. I remain only as this. This is silence. This truly is silence, effortless silence. But initially, because of the tendency to identify with mind and with doership, with the sense 'I am the doer', you will miss this truth. Because the inclination of a doer is to do something about it. Here I am saying 'Do nothing, remain only as this'. Stay empty, observe. Whatever thought is arising, whatever sensation, you are not going to be a traffic policeman in them. 'The 'I' itself who would try to suppress and push is only the way I have learnt to be, what I have accustomed myself to believe in as myself. And I see clearly now that that is just a thought arising in me. Now I don't touch that'. What remains? What remains? That I am. 'I' as any information, 'you' as any information is nothing at all; not true. What remains when there is no 'I am…, you are… Take nothing to be yourself, and yourself will remain. It is so, whether you realize it or not. Realize it and live in the fullness of emptiness. Up until now, you were under the impression that the thoughts you had were about you. You have seen the price and the cost of indulging such thoughts. They have brought you nothing but misery. They have been full of promises to a better life, increased enjoyment and success in this world. Some lucky few have seen through this and seen it's not like that. These promises have been like the promises of politicians - very sweet, but they don't come to fruition, they don't bring what they claim. You have seen through this and felt the impact of the burden of unfulfilled promises and desires. Thus your very disappointment has brought you to Satsang, has brought you here. I am satsang. This is not a personal statement. I am satsang. The play of satsang arises in me, and you have come to satsang. This satsang is not a place. There is no map to get here. This satsang is not taking place at 12 Fairview House; this satsang is taking place in you. This 'I am' is your own self. Consciousness has presented you with this wonderful opportunity: Return to me. This 'me' is your own self. Don't touch anything. Don't keep company with any thought. Throw away everything. Throw away also your very self, the thoughts you have about yourself, and stay only as that which remains. "When we walk upon Mother Earth, we always plant our feet carefully because we know the faces of our future generations are looking up at us from beneath the ground. We never forget them. In the absence of the sacred, nothing is sacred. Everything is for sale." 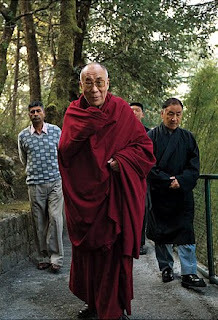 His Holiness the Dalai Lama gave this teaching on the four noble truths in Dharamsala, India 7 October 1981. It was translated by Alexander Berzin, clarified by Lama Zopa Rinpoche, edited by Nicholas Ribush and first published in the souvenir booklet for Tushita Mahayana Meditation Centre's Second Dharma Celebration, November 5-8 1982, New Delhi, India. Published in 2005 in the LYWA publication Teachings From Tibet. When the great universal teacher Shakyamuni Buddha first spoke about the Dharma in the noble land of India, he taught the four noble truths: the truths of suffering, the cause of suffering, the cessation of suffering and the path to the cessation of suffering. Since many books contain discussions of the four noble truths in English, they (as well as the eightfold path) are very well known.1 These four are all-encompassing, including many things within them. Considering the four noble truths in general and the fact that none of us wants suffering and we all desire happiness, we can speak of an effect and a cause on both the disturbing side and the liberating side. True sufferings and true causes are the effect and cause on the side of things that we do not want; true cessation and true paths are the effect and cause on the side of things that we desire. We experience many different types of suffering. All are included in three categories: the suffering of suffering, the suffering of change and all-pervasive suffering. Suffering of suffering refers to things such as headaches and so forth. Even animals recognize this kind of suffering and, like us, want to be free from it. Because beings have fear of and experience discomfort from these kinds of suffering, they engage in various activities to eliminate them. Suffering of change refers to situations where, for example, we are sitting very comfortably relaxed and at first, everything seems all right, but after a while we lose that feeling and get restless and uncomfortable. In certain countries we see a great deal of poverty and disease: these are sufferings of the first category. Everybody realizes that these are suffering conditions to be eliminated and improved upon. In many Western countries, poverty may not be that much of a problem, but where there is a high degree of material development there are different kinds of problems. At first we may be happy having overcome the problems that our predecessors faced, but as soon as we have solved certain problems, new ones arise. We have plenty of money, plenty of food and nice housing, but by exaggerating the value of these things we render them ultimately worthless. This sort of experience is the suffering of change. A very poor, underprivileged person might think that it would be wonderful to have a car or a television set and, should he acquire them, would at first feel very happy and satisfied. Now, if such happiness were permanent, as long as he had the car and the TV set he would remain happy. But he does not; his happiness goes away. After a few months he wants another kind of car; if he has the money, he will buy a better television set. The old things, the same objects that once gave him much satisfaction, now cause dissatisfaction. That is the nature of change; that is the problem of the suffering of change. All-pervasive suffering is the third type of suffering. It is called all-pervasive [Tib: kyab-pa du-che kyi dug-ngäl—literally, the suffering of pervasive compounding] because it acts as the basis of the first two. There may be those who, even in developed countries, want to be liberated from the second suffering, the suffering of change. Bored with the defiled feelings of happiness, they seek the feeling of equanimity, which can lead to rebirth in the formlessness realm that has only that feeling. Now, desiring liberation from the first two categories of suffering is not the principal motivation for seeking liberation [from cyclic existence]; the Buddha taught that the root of the three sufferings is the third: all-pervasive suffering. Some people commit suicide; they seem to think that there is suffering simply because there is human life and that by ending their life there will be nothing. This third, all-pervasive, suffering is under the control of karma and the disturbing mind. We can see, without having to think very deeply, that this is under the control of the karma and disturbing mind of previous lives: anger and attachment arise simply because we have these present aggregates. The aggregate of compounding phenomena is like an enabler for us to generate karma and these disturbing minds; this is called nä-ngän len [literally, taking a bad place]. Because that which forms is related to taking the bad place of disturbing minds and is under their control, it supports our generating disturbing minds and keeps us from virtue. All our suffering can be traced back to these aggregates of attachment and clinging. Perhaps, when you realize that your aggregates are the cause of all your suffering, you might think that suicide is the way out. Well, if there were no continuity of mind, no future life, all right—if you had the courage you could finish yourself off. But, according to the Buddhist viewpoint, that’s not the case; your consciousness will continue. Even if you take your own life, this life, you will have to take another body that will again be the basis of suffering. If you really want to get rid of all your suffering, all the difficulties you experience in your life, you have to get rid of the fundamental cause that gives rise to the aggregates that are the basis of all suffering. Killing yourself isn’t going to solve your problems. Because this is the case, we must now investigate the cause of suffering: is there a cause or not? If there is, what kind of cause is it: a natural cause, which cannot be eliminated, or a cause that depends on its own cause and therefore can be? If it is a cause that can be overcome, is it possible for us to overcome it? Thus we come to the second noble truth, the truth of the cause of suffering. Buddhists maintain that there is no external creator and that even though a Buddha is the highest being, even a Buddha does not have the power to create new life. So now, what is the cause of suffering? Generally, the ultimate cause is the mind; the mind that is influenced by negative thoughts such as anger, attachment, jealousy and so forth is the main cause of birth and all such other problems. However, there is no possibility of ending the mind, of interrupting the stream of consciousness itself. Furthermore, there is nothing intrinsically wrong with the deepest level of mind; it is simply influenced by the negative thoughts. Thus, the question is whether or not we can fight and control anger, attachment and the other disturbing negative minds. If we can eradicate these, we shall be left with a pure mind that is free from the causes of suffering. This brings us to the disturbing negative minds, the delusions, which are mental factors. There are many different ways of presenting the discussion of the mind, but, in general, the mind itself is something that is mere clarity and awareness. When we speak of disturbing attitudes such as anger and attachment, we have to see how they are able to affect and pollute the mind; what, in fact, is their nature? This, then, is the discussion of the cause of suffering. object looks ugly, completely repulsive, nauseating; something we want to get rid of immediately—it appears really to exist in that way: solid, independent and very unattractive. This appearance of “truly ugly” fuels our anger. Yet when we see the same object the next day, when our anger has subsided, it seems more beautiful than it did the day before; it’s the same object but it doesn’t seem as bad. This shows how anger and attachment are influenced by our grasping at things as being true and unimputed. Thus, the texts on Middle Way [Madhyamaka] philosophy state that the root of all the disturbing negative minds is grasping at true existence; that this assists them and brings them about; that the closed-minded ignorance that grasps at things as being inherently, truly real is the basic source of all our suffering. Based on this grasping at true existence we develop all kinds of disturbing negative minds and create a great deal of negative karma. In his Entering the Middle Way [Madhyamakavatara], the great Indian pandit Chandrakirti says that first there’s attachment to the self, which is then followed by grasping at things and becoming attached to them as “mine.”4 At first there is a very solid, independent I that is very big—bigger than anything else; this is the basis. From this gradually comes “this is mine; this is mine; this is mine.” Then “we, we, we.” Then, because of our taking this side, come “others, our enemies.” Towards I and mine, attachment arises. Towards him, her and them, we feel distance and anger; then jealousy and all such competitive feelings arise. Thus ultimately, the problem is this feeling of “I”—not the mere I but the I with which we become obsessed. This gives rise to anger and irritation, along with harsh words and all the physical expressions of aversion and hatred. All these negative actions (of body, speech and mind) accumulate bad karma.5 Killing, cheating and all similar negative actions also result from bad motivation. The first stage is solely mental, the disturbing negative minds; in the second stage these negative minds express themselves in actions, karma. came into his or her mind. When you get angry, there’s no room for logic or reason; you become literally mad. Later, when your mind has returned to normal, you feel ashamed. There’s nothing good about anger and attachment; nothing good can result from them. They may be difficult to control, but everybody can realize that there is nothing good about them. This, then, is the second noble truth. Now the question arises whether or not these kinds of negative mind can be eliminated. The root of all disturbing negative minds is our grasping at things as truly existent. Therefore, we have to investigate whether this grasping mind is correct or whether it is distorted and seeing things incorrectly. We can do this by investigating how the things it perceives actually exist. However, since this mind itself is incapable of seeing whether or not it apprehends objects correctly, we have to rely on another kind of mind. If, upon investigation, we discover many other, valid ways of looking at things and that all these contradict, or negate, the way that the mind that grasps at true existence perceives its objects, we can say that this mind does not see reality. Middle Way schools contain many lines of reasoning for carrying out such investigation.6 Following these, when you investigate to see whether the mind that grasps at things as inherently findable is correct or not, you find that it is not correct, that it is distorted—you cannot actually find the objects at which it grasps. Since this mind is deceived by its object it has to be eliminated. Thus, through investigation we find no valid support for the grasping mind but do find the support of logical reasoning for the mind that realizes that the grasping mind is invalid. In spiritual battle, the mind supported by logic is always victorious over the mind that is not. The understanding that there is no such thing as truly findable existence constitutes the deep clear nature of mind; the mind that grasps at things as truly findable is superficial and fleeting. When we eliminate the disturbing negative minds, the cause of all suffering, we eliminate the sufferings as well. This is liberation, or the cessation of suffering: the third noble truth. Since it is possible to achieve this we must now look at the method. This brings us to the fourth noble truth. When we speak of the paths common to the three vehicles of Buddhism—Hinayana, Mahayana and Vajrayana—we are referring to the thirty-seven factors that bring enlightenment. When we speak specifically of the paths of the bodhisattvas’ vehicle [Mahayana] we are referring to the ten levels and the six transcendent perfections. We find the practice of the Hinayana path most commonly in Thailand, Burma, Sri Lanka and so forth. Here, practitioners are motivated by the desire to achieve liberation from their own suffering. Concerned for themselves alone, they practice the thirty-seven factors of enlightenment, which are related to the five paths: the four close placements of mindfulness, the four miraculous powers and the four pure abandonments (which are related to the path of accumulation); the five powers and the five forces (the path of preparation); the seven factors of enlightenment (the path of seeing); and the eightfold path (the path of meditation). In this way, they are able to completely cease the disturbing negative minds and attain individual liberation. This is the path and result of the Hinayana. The primary concern of followers of the Mahayana path is not merely their own liberation but the enlightenment of all sentient beings. With this motivation of bodhicitta—their hearts set on attaining enlightenment as the best means of helping others—these practitioners practice the six transcendent perfections and gradually progress through the ten bodhisattva levels until they have completely overcome both types of obscurations and attained the supreme enlightenment of buddhahood. This is the path and the result of the Mahayana. 1. See, for example, Tsering, Geshe Tashi. The Four Noble Truths. Boston: Wisdom Publications, 2005. Also: Gyatso, Lobsang. The Four Noble Truths. Ithaca: Snow Lion Publications, 1994. 2. The five aggregates [Skt: skandha]—one physical and four mental—are the elements that constitute a sentient being of the desire and form realms. Beings of the formless realm have only the four mental aggregates. See Gyatso, Tenzin. Opening the Eye of New Awareness. Boston: Wisdom Publications, p. 33. 4. See Rabten, Geshe. Echoes of Voidness. Boston: Wisdom Publications, 1983, Part 2. 5. See Opening the Eye of New Awareness, p. 43 ff., for details of the ten non-virtuous actions of body, speech and mind. 6. See Gyatso, Tenzin. The Buddhism of Tibet. Ithaca: Snow Lion Publications, 1987. 7. See Hopkins, Jeffrey; Meditation on Emptiness: Wisdom Publications, 1983. 8. See His Holiness the Dalai Lama’s introduction to Tantra in Tibet. Ithaca: Snow Lion Publications, 1987, for a detailed explanation of method and wisdom in sutra and tantra. "Whenever you relinquish a behavior pattern, inner space emerges. You become more truly yourself. You become less, so you can become more." At times it can be very stressful, but those times will pass and you will be onto the next chapter in your life. Say yes to the now as Eckhart Tolle says, and those difficult times will be less difficult and less stressful. Don’t fight the flow, go with it. Do what you have to do now, but don’t let situations or events in your life drive your emotions. Your emotions are a byproduct of what you are thinking, so don’t dwell on things that you cannot change. If you can do something to make the situation better, do it. If you cannot then let it be and get back to your life. We cannot force situations or people to do what we want them to do, but we can accept what is and stay centered in our peace, not effected by outcomes, expectations, external events, or people. The separate self dissolves in the sea of pure consciousness, infinite and immortal. Separateness arises from identifying the Self with the body, which is made up of the elements; when this physical identification dissolves, there can be no more separate self. This is what I want to tell you, beloved. What the sages sought they have found at last. No more questions have they to ask of life. With self-will extinguished, they are at peace. Seeing the Lord of Love in all around, Serving the Lord of Love in all around, they are united with him forever. The Vedas are considered the earliest literary record of Indo-Aryan civilization, and the most sacred books of India. They are the original scriptures of Hindu teachings, and contain spiritual knowledge encompassing all aspects of our life. 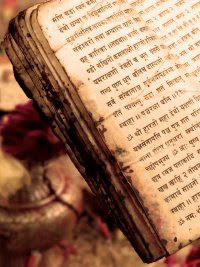 Vedic literature with its philosophical maxims has stood the test of time and is the highest religious authority for all sections of Hindus in particular and for mankind in general. Veda” means wisdom, knowledge or vision, and it manifests the language of the gods in human speech. The laws of the Vedas regulate the social, legal, domestic and religious customs of the Hindus to the present day. All the obligatory duties of the Hindus at birth, marriage, death etc. owe their allegiance to the Vedic ritual. They draw forth the thought of successive generation of thinkers, and so contain within it the different strata of thought. people can find their own way. avoid being clever or rich. The simplest pattern is the clearest. back to their own true nature. How people treat you is their karma. How you react is yours. Having gone beyond the mind-made opposites, you become like a deep lake. The outer situation of your life and whatever happens there is the surface of the lake. Sometimes calm, sometimes windy and rough, according to the cycles and seasons. Deep down, however, the lake is always undisturbed. You are the whole lake, not just the surface, and you are in touch with your own depth, which remains absolutely still. You don’t resist change by mentally clinging to any situation. Your inner peace does not depend on it. You abide in Being – Unchanging, timeless, deathless – and you are no longer dependent for fulfillment or happiness on the outer world of constantly fluctuating forms. You can enjoy them, play with them, create new forms, appreciate the beauty of it all. But there will be no need to attach yourself to any of it. Question: When you become this detached, does it not mean that you also become remote from other human beings? On the contrary. As long as you are unaware of Being, the reality of other humans will elude you, because you have not found your own. Your mind will like or dislike their form, which is not just their body but includes their mind as well. True relationship becomes possible only when there is an awareness of Being. Coming from Being, you will perceive another person’s body and mind as just a screen, as it were, behind which you can feel their true reality, as you feel yours. So, when confronted with someone else’s suffering or unconscious behavior, you stay present and in touch with Being and are thus able to look beyond the form and feel the other person’s radiant and pure Being through your own. At the level of Being, all suffering is recognized as an illusion. Suffering is due to identification with form. Miracles of healing sometimes occur through this realization, by awakening Being consciousness in others – if they are ready. Question: Is that what compassion is? Yes. Compassion is the awareness of a deep bond between yourself and all other creatures. But there are two sides to compassion, two sides to this bond. On the one hand, since you are still here as a physical body, you share the vulnerability and mortality of your physical form with every other human and with every living being. Next time you say, “I have nothing in common with this person”, remember that you have a great deal in common: A few years from now – two years or seventy years, it doesn’t make much difference – both of you will have become rotting corpses, then piles of dust, then nothing at all. This is a sobering and humbling realization that leaves little room for pride. Is this a negative thought? No, it is a fact. Why close your eyes to it? In that sense, there is total equality between you and every other creature. One of the most powerful spiritual practices is to meditate deeply on the mortality of physical forms, including your own. This is called: Die before you die. Go into it deeply. Your physical form is dissolving, is no more. Then a moment comes when all mind-forms or thoughts also die. Yet you are still there – the divine presence that you are. Radiant, fully awake. Nothing that was real ever died, only names, forms, and illusions. Not caring what other people think is when you experience true peace in your life. And the only way to not care what other people think is to lose your ego. The same concept as “Die while you are alive.” You will continue to suffer and be miserable if you get upset every time someone attacks you verbally, attacks your ego, because your ego gets offended and becomes defensive. You cannot change what others do or say. It is not about them, nor is it about you. Without the ego it does not matter what they say, because you (your ego) is not important anymore. People who attack others verbally are coming from a place of ego (body-mind), the egoic state of consciousness. Like Adyashanti says, “Be a nobody.” If you are a nobody who is there to defend? Who is there to stand up for? Nobody! This is hard to swallow at first, the idea of being a nobody, because society, especially in the west, strives for recognition, accomplishment, a good reputation, pleasing others, increasing material wealth, and comparison of what one has (material objects) with what another has. So, you have a choice, continue to suffer or be a nobody. The morning of our lives, the early part of our lives we are almost conditioned to believe that who we are is what we are able to collect, and what we do, and what other people think of us, and to evaluate our essence and who we are as human beings on the basis of how well we are received by others, how much we accumulate, how far ahead we get and so on, but there is something that is very missing in that and that is what we call meaning. The great hunger. The real great hunger that tribesmen said is the hunger for meaning, to know that your life is on purpose. And if your life is all about what you accumulate and how much you win and what other people think of you, you get a great reputation. The problem with that is that if you are what you do then when you don’t you aren’t and when you are what you have when it disappears your essence as a human being disappears as well. The Shift is really an attempt to teach people what Carl Jung called, “What happens to you when you move into the afternoon of your life.” Which is you begin to focus, not so much on what the ego says, which is what’s in it for me and how much can I get and how far ahead am I than everybody else versus the mantra of the higher self, the spiritual self, is how may I serve, you know god realization, thinking like god thinks. Interviewer: This all sounds great. I’m sure that everybody around me, for example, would love for me to have a smaller ego, but how do you do it practically? Dyer: You know, the Dalai Lama once said that if we could take every child on this planet and teach them to meditate on compassion for one hour a week, just one hour a week, in one generation we could eliminate all violence on the planet. Just teaching people to put their focus on reaching out and having compassion for others. And that’s really what happens as you begin to leave the ego behind. Interviewer: I have and a lot of people who are watching this have very competitive jobs. Are you advising that we should quit our jobs? Or, how do we make this shift that you are talking about and stay in the lives that we have thus far? Dyer: I would advise anyone to quit a job that doesn’t give them fulfillment and doesn’t make them feel like they are living their life on purpose. I think that if you don’t quit it, it will quit you. It will take you down. The Shift illustrates how and why to make the move From Ambition To Meaning. Such a shift eliminates our feelings of separateness, illuminates our spiritual connectedness, and involves moving from the ego-directed morning into the afternoon of life where everything is primarily influenced by purpose. The Shift doesn’t mean that we lose our drive and Ambition; it signifies that we become ambitious about something new. We make a commitment to living a life based on experiencing Meaning and feeling purposeful, rather than never-ending demands and false promises that are the trademark of the ego’s agenda. As Wayne so eloquently reveals in these pages, we all have the choice to shift our lives From Ambition To Meaning . . . and thereby complete our return to the Source that created us.